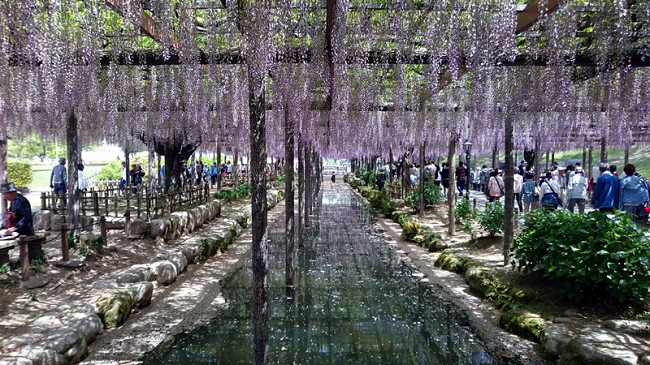 After Tokyo, Kyoto, is perhaps the biggest draw for foreigners coming to Japan. 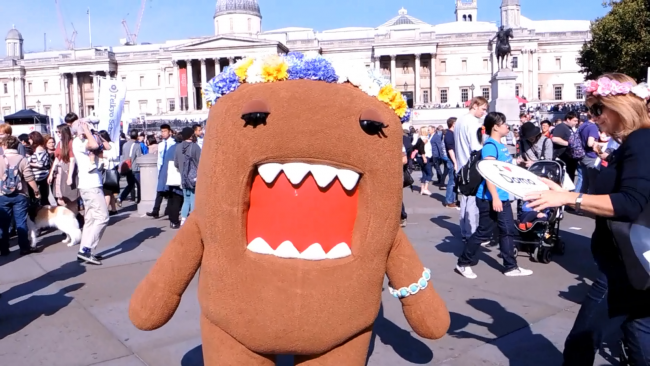 Which is understandable – after all, it was the capital for over a thousand years. Personally, I love Kyoto as a city. It caters for those who want to immerse themselves in its iconic shrines, but also offers some great shopping if you just want to indulge in some quality consumption while you visit. Terrific food is a constant here too. The challenge with Kyoto is how to sample some of its ancient history and culture whilst avoiding the increasingly huge crowds flocking to its colourful and justifyably famous shrines. And to experience something off-the-beaten-path. Head north to Kamigamo Shrine. Kamigamo Shrine, is an important Shinto sanctuary on the banks of the Kamo River in north Kyoto, first founded in 678. 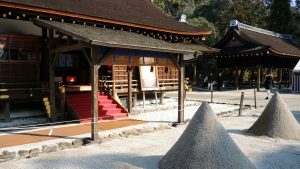 Its formal name is the Kamo-wakeikazuchi Shrine. 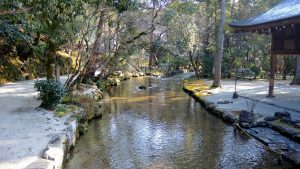 Due to its location in the far north of Kyoto city (away from the most popular tourist areas) it can easily be missed if you don’t know to look for it. 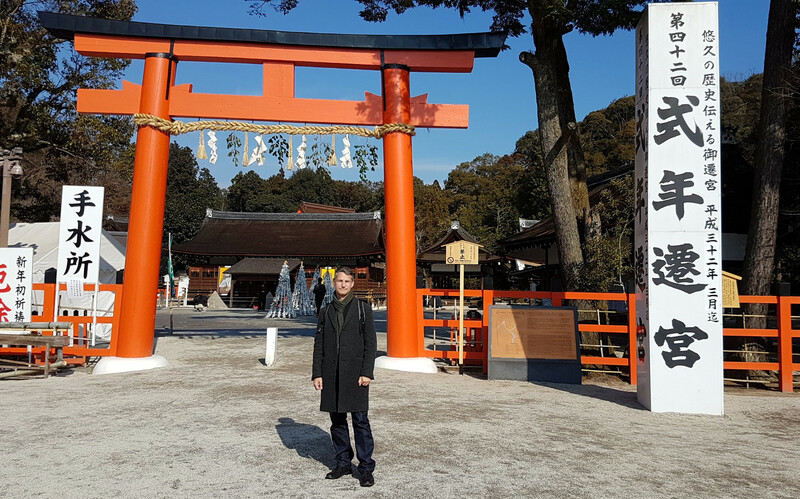 It is one of the oldest Shinto shrines in Japan and is one of the seventeen Historic Monuments of Ancient Kyoto which have been designated by UNESCO as a World Heritage Site. Kamigamo jinja (shrine) is famous for its haiden (worship hall), rebuilt in 1628-1629. A number of priests’ residences are situated on its grounds, and one, the Nishimura House, is open to the public. The term Kamo-jinja in Japanese is a general reference to Shimogamo Shrine and Kamigamo Shrine, the traditionally linked Kamo shrines of Kyoto. 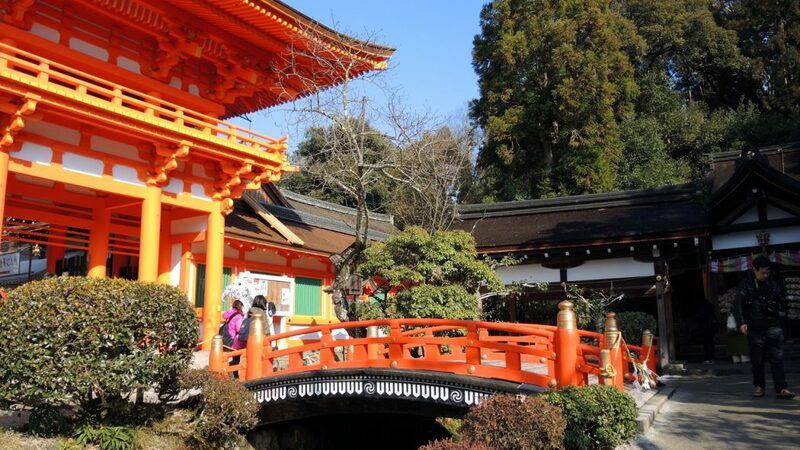 The Kamo-jinja serve the function of protecting Kyoto from evil influences. The jinja name identifies the Kamo family of kami or deities who are venerated. Kamogamo Shrine is dedicated to the veneration of Kamo Wake-ikazuchi, the kami (god) of thunder, who is celebarted in the Aoi Matsuri (festival) held here every year. According to ancient records, the festival originated during the reign of Emperor Kinmei (539 – 571). A succession of disastrous rains with high winds ruined the grain crops, and epidemics spread through the country. Diviners believed this was punishment by the Kamo deities. The Emperor sent an entourage to the shrine to conduct various acts to appease the deities, in prayer for a bountiful harvest. Included in Emperor Kinmei’s acts was the riding of a galloping horse. This became an annual ritual, and the galloping horse performance developed into an equestrian archery performance. 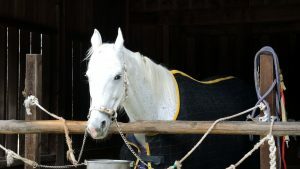 To this day, the Shrine has a white horse stabled there which visitors can pet and feed. Also worth checking out whilst you’re in the north of Kyoto is the Stardust Vegan Cafe & Boutique. 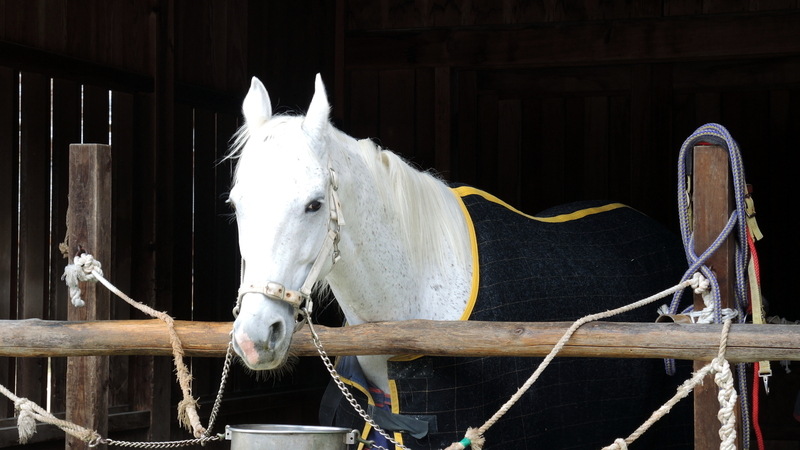 In the film below we explore Kamigamo Shrine. Shot in January (just as the last snow was melting), it begins outside the second torii (gate), where a groundswoman is burning felled tree wood. Watching the meltwater dripping from the roof of the Maidono, we walk towards the heart of the shrine. Passing through the manicured gardens. We stop in front of the main romon (tower gate), watching as pilgrims enter the inner honden. The honden is the most sacred building at a Shinto shrine, intended purely for the use of the enshrined kami. 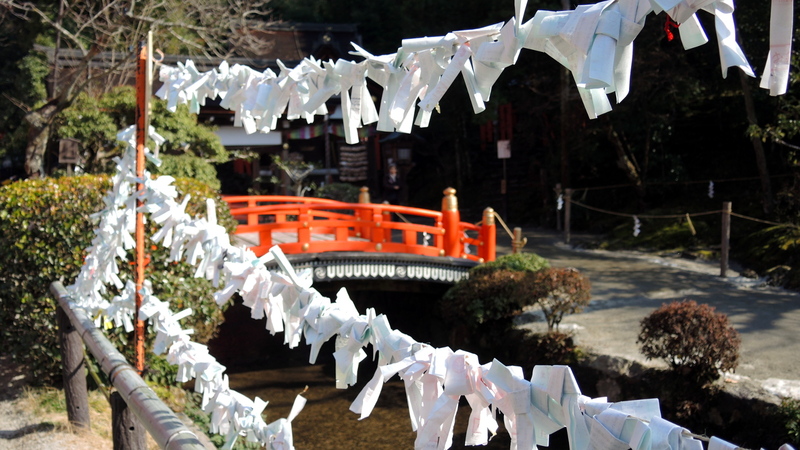 Next to the Omonomi stream, strips of paper, called omokuji, containing the worshippers’ fortunes are tied in decorative rows in front of the tower gate in the hope that the good fortune they predict will come to pass. The Kamo River that wends its way through the shrine grounds gently ripples as we cross over it on the negi-bashi bridge. We turn to walk past the Tsuchi-no-ya building where people engaged in rituals and ceremonies to purify themselves before participating. We head back out, pausing to turn and look back at the Hosodono building – known for the cones of sand, belived to have purification powers, that stand in front of it. 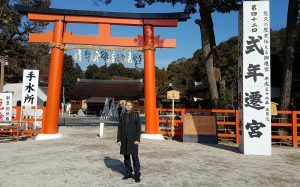 Finally, we walk towards the distinctive red of the second torii – the gateway standing at the entrance to the shrine – from where we started our tour. Torii indicate that the area inside the gateway is sacred space. Kamigamo Shrine can get busy in high season and on festival days. If you want to experience something of the spiritual nature many seek when visiting here, then going on a week day out of high season is likely to get you closer to that. If you liked this article and film you might like to subscribe to my YouTube channel HERE. Be sure to hit the bell icon to get notifications of all new posts! I post a new inspirational video every Friday. The easiest way to get to the shrine is either by taxi or by bus. Taxi will be quickest. Kyoto City Bus #4 runs directly to the shrine from Kyoto Station – takes approx 30mins. Kyoto City Bus #46 runs from downtown Kyoto, Gion, Higashiyama, Kyoto Imperial Palace and Nijo Castle.